So since the last time I posted, a number of things have happened. I got a call for my first job interview, which happens on Monday afternoon and there's a good chance I'll get another interview this week (I know a guy). It feels good to be in our own place. The neighborhood is great, our landlords are super nice and it's a solid apartment. I'll post some photos once it gets a little more settled. So far I've managed to get a few things on the walls and my sewing machine on my desk, but no clothes out a suitcase. We all have our own priorities. I went to a new knitting circle on Tuesday, I'll have to give it a few more tries to see if it's a good personality fit or not. It was a really small gathering, so I'm not sure it was representative, but we'll see. 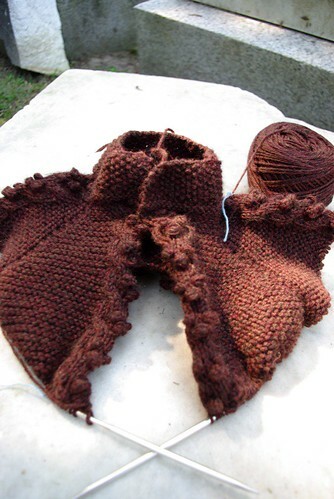 Other than that, knitting's been on the backburner to unpacking, but I did finally take some photos of WIPs to share. The photo above is the Forecast cardigan. A surprisingly simple knit, with more purling than I'd like, but I really enjoy the pattern. I'm knitting it in Cascade 220 Heather and I am really enjoying this yarn. It's very spriongy! 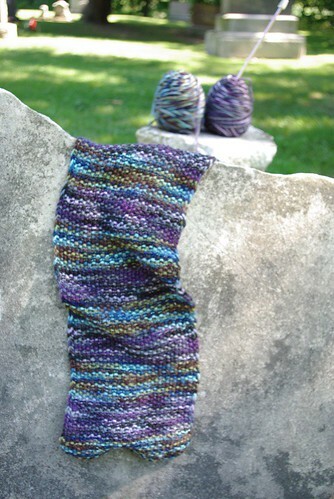 This scarf I haven't worked on since Chicago, but I thought I'd photograph it too. It's my "Seed-Stitch Self-Striping Striped Scarf." It's not very interesting to knit and I dislike making scarves in general, but I loved the colors and wanted something simple to display them. The blue-green color is particularly special since it's the Edgewater colorway from Lorna's Lace, which is my old Chicago neighborhood. The Purple is called Black Purl. It's just a nubbly scarf, but I like it. I might pull tassles on at the ned, but we'll see, I still have a lot of length to knit. We don't have internet in the apartment yet, so the posting may still be spotty for a while. But keep your fingers crossed for me tomorrow!